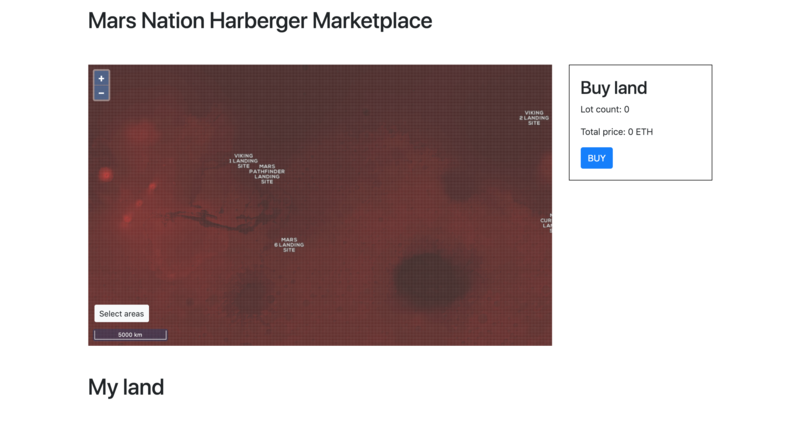 We built a polygon land selector for our project marsnation.io to enable visual batch selection of NFTs on a map. Mars Nation is a global democratic experiment trying to answer how planet Mars should be governed and how its land should be distributed. Virtual Mars land is sold to fund the project with the goal to become a sovereign nation with recognized property rights in the long run. A Harberger taxation model is applied to the land to increase the allocation efficiency. With Harberger, all land is always on sale and each land has a self-assessed value. This requires new tools to simplify the buying process. The polygon selector allows to draw any desired shape to select finite land lots. Land will be represented by non-fungible ERC1155 tokens allowing batch transfers of NFTs. Buying opens Meta Mask where you can confirm your purchase. At this point the smart contract is not implemented and connected to the polygon selector since we focused on the frontend tool as a new innovation. We believe that such a tool would fit well into the future stack of 0x since it offers a great user experience as 0x Instant does. 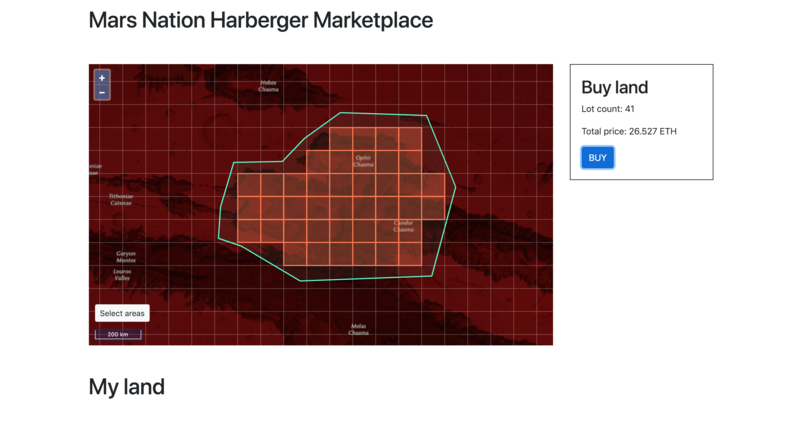 The polygon selector could also be used on a normal marketplace without Harberger taxation where land lots are being sold.